Enjoy the view of this incredibly maintained second floor condo with two covered patio decks, overlooking open space with lots of sunshine! The private view outside the living room will allow you to cozy up in front of your gas fireplace or grill outside on spacious balcony. The kitchen includes a granite breakfast bar and dining space. Conveniently located near the Cherry Creek walking and bike trail. Additional features include both a separate laundry room and assigned PARKING GARAGE SPACE E. Fitness Center, Clubhouse with business center and outdoor pool/hot tub are steps away. 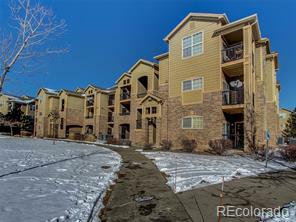 Easy access to shopping, park with playground, volleyball court, restaurants and C-470/Jordan Road. Rare location as the back side of the building faces an open space for extra privacy and serenity.